List of names of the “Fallen,” on the Flintshire WW1 Index Cards for Queensferry. Ref No Grave or Memorial / Rhif cyfeirnod bedd: Pier and Face 3 C and 4 A. Therefore Elizabeth Rogers may have been born before the marriage of Robert & Martha, but in any case they were all to suffer a bereavement when Martha died age 30 in 1891 (Cheshire West CAS/49/83). I believe that Robert remarried in the June quarter of 1899 in Cheltenham, Gloucestershire to Elizabeth Julia Hannis as on the 1891 census, the whole family and Robert’s new bride had moved to 65, Handbridge (7 rooms) and Elizabeth Julia, 36 tells us that she had been born in Great Witcombe, Gloucestershire. Robert himself had become the first Curator of the Chester Museum, he was no 41 and on this census he tells us that he had been born in Swarton Abbot, Norfolk. Their family had increased as a new daughter, Gladys May , 11 months had been born in Chester. Their children, Robert, 15, John H. 13, Lilian E., 12 and Rupert, 10, were still in the family along with an uncle, Alfred Newstead, Robert’s brother, 22 and single who was an Assistant Curator, he had been born in Upwell, Cambridgeshire. There was a servant Catherine O’Brian, 20 who had been born in Rock Ferry. In 1911 the family were still living at 65, Handbridge, Chester. Robert, 51, states on the census that they had been married 11 years and he was now a Lecturer in Medical Entomology at a University. Elizabeth tells us that only 1 child had been born to them and she was still living and Gladys May was 10 years old. Robert (Junior) was single, age 25 and a “Sculptor & Carver,” Rupert Randolph, 20, was an Analytical Chemist with a Manufacturing Chemist. Daughter Lilian Ethel, 22 was single and had no occupation. There was a Niece Ethel Elizabeth Lulham, 20, also with no occupation and had been born in Whitcombe, Norfolk. There was a Servant, Elizabeth Hughes, 25, single, who was employed as a Sick Nurse (Infirmary) who had been born in Beaumaris, Anglsey, so perhaps there was someone chronically sick in the household. 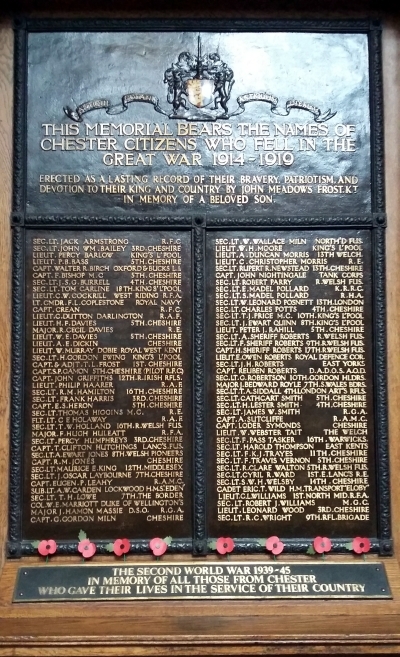 Rupert Randolph must have become an employee of the Queensferry Chemical Works as he is on the Roll of Honour that is held in the Flintshire Record Office in Rectory Lane, Hawarden. On this his date of death is shown as the 9th July 1916. It was this source that told me that to my knowledge Rupert hadn’t been remembered anywhere, so I am glad he has been found and will now be remembered. He must have enlisted in September 1914 when the war started according to his Commonwealth War Graves Commission Record and his father Robert, was by then Professor R. Newstead, his mother was shown as Elizabeth J. Newstead, but this, we know is not strictly true, not biologically anyway, but I am sure, in any other way, was his mother. Rupert Randolph Newstead in the UK, Soldiers Died in the Great War, 1914-1919 confirms his regimental details and that he was a 2nd Lieutenant. Rupert Randolph Newstead in the UK, WWI Service Medal and Award Rolls, 1914-1920, tell us he was a Private in the Kings Liverpool Regiment and his number was 3389 and his previous units were 1/10th K.L.R. and he had been an Acting Corporal. Rupert Randolph Newstead in the British Army WWI Medal Rolls Index Cards, 1914-1920 tell us that his Theatre of War was France and he entered the on the 23rd January 1915 and he was killed in Action on the 7th July 1916. On the Reverse of card – it states – R. NEWSTEAD Esq., St. Mary Cottage, 67, Hanbridge, Chester. R R Newstead in the UK, Army Registers of Soldiers’ Effects, 1901-1929 unusually there seems to be no legatees, just the amounts below, with their destination:- Cox & Co. and Regimental Paymaster, Preston £3.10 respectively on September 1916. Transfer 146 £60 15s 0d on the 8th November 1916, C.P. Base £1 9s 3d in September 1916 and again Cox & Co. 6/8d in September 1916. A War Gratuity of £5 was among his effects. I suspect that Cox & Co were Solicitors. Rupert’s father Robert was to die on the 16th February 1947 and his Probate in the England & Wales, National Probate Calendar (Index of Wills and Administrations), 1858-1966 – NEWSTEAD, Robert of 67, Handbridge, Chester died 16th February 1947, Probate Chester 4th July to Lloyds Bank Limited. Effects £5388. 14s 3d. He was an Archaeologist. 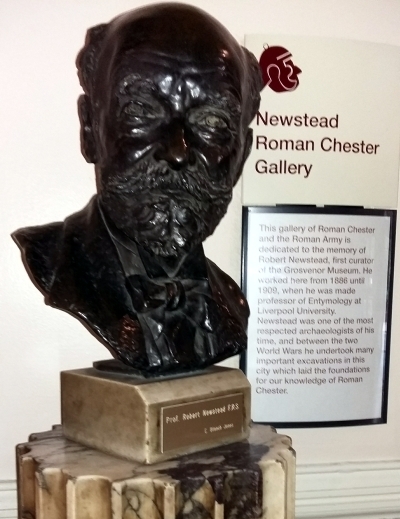 In 1886 he became the first Curator of the Grosvenor Museum, Chester. In 1905 he was appointed Lecturer in Entymology and Parasitology at Liverpool University. He excavated many sites in Chester – the Amphitheatre, Deanery Field, Infirmary Field, South East Angle Tower and Princess Street. He lived at St Mary’s Cottage, 67 Handbridge, Chester. Died aged 87 yrs. He was buried on the 19th February 1947. I cannot find any Attestation Papers for Rupert, but he was killed in action and his body must never have been found as he is remembered on the Thiepval Memorial.